Peace Direct’s local peace building expert for Yemen (and previous Warscapes contributor), Ahmed Al-Yemeni, recently returned home after 12 months in exile abroad. In this harrowing dispatch, he describes the trail of devastation he followed from Yemen’s capital, Sana’a, all the way to his family village. 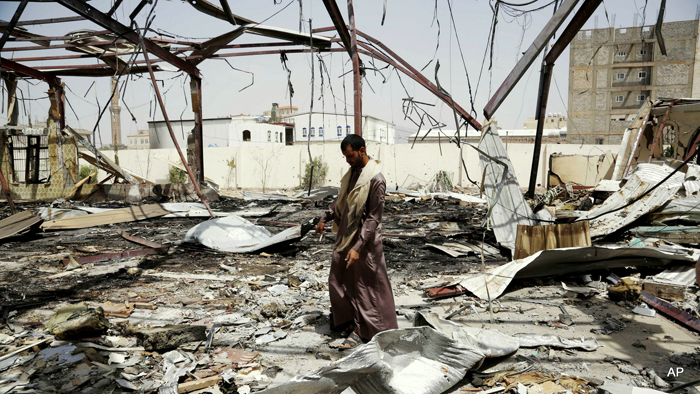 Following Yemen’s war from a distance is not like living it. Touching and feeling the agony and suffering of Yemenis, as well as hearing the airstrikes and visiting the areas targeted, is epic and dramatic. It is also full of blood, and the cries of those killed and injured. It is a dark portrait, with many destroyed schools, hospitals, bridges and public infrastructure – destroyed for unclear reasons and a strategic vision that no one can understand or justify. So many times, these “smart” missiles have lost their way. I have been abroad for the last year, travelling – stranded – in Germany, Poland, Turkey and Jordan. But it was time to go home, despite the risks. My journey back to Yemen took me first through the hardship and siege of the Saudi-led, nine-country coalition forces. There is a no fly zone all over Yemen, and a total sea blockade. No commercial or humanitarian shipments, aid, food, basic supplies or fuel can enter the country without permission. The only airline operating is Yemenia. It runs very limited flights in and out the country, which are frequently suspended. This an ugly proxy war, and most airports are closed. I was lucky enough to get in before the current suspensions and make it to Sana’a International Airport, the only pair of lungs for 20 million Yemenis. I had to wait for more than a month to catch my flight back to Sana’a, passing through Bisha in Saudi Arabia to undergo the infamous security check of Yemenis, joining a long line of elderly, sick, students and others who have been stranded across the world. When I landed in Sana’a, the destruction that the airstrikes have inflicted upon the airport was clear. Civilian and military planes were laying burnt and destroyed on the ground. Driving out, I was horrified by the sheer scale of the damage: military and security buildings, schools, factories, roads, gardens and TV and radio infrastructure destroyed – along with my poor city neighborhood, which I finally reached. At first, I had thought I was unlucky to live near Nuqum Mountain (east of the capital), as it has been suffering from almost daily airstrikes, but the reality is it does not matter where you live in Yemen. How is it that Western-made guided missiles, rockets, planes and drones somehow find their way into civilian neighborhoods across the country? I wonder, as many Yemenis here joke about, if they will ever find and destroy the nuclear or other military facilities they must believe are hidden under this or that mountain or village. 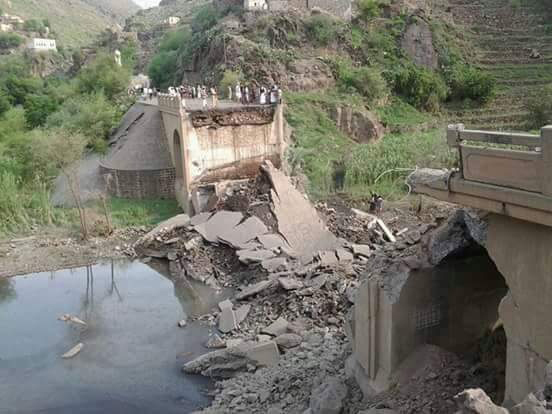 A bridge destroyed in rural Yemen in a Saudi air strike. Most people neither know nor care about the war’s geopolitics. They care about their lives. It was dark at home. There has been no electricity since the war started. Everything was covered in thick dust, and the windows and doors were broken from the shockwaves of air strikes. I wondered what we would do. The next morning, I realized that many of my neighbors were still there, refusing to leave. Local leaders and charities were working together, reopening old wells in the city. They’ve started to put small public water tanks in the different neighborhoods for people to drink from and otherwise sustain themselves. My neighbors are not even thinking of leaving. Where would they go? They have begun to assemble simple solar systems, which most people now depend on. What a daily struggle – and resistance. Although I have been constantly amazed and terrified of the air strikes, which seem never to stop, those who have been here longer, or all along, do not even look up any more. They are trying to lead their normal lives, and to find food for their families. Shops, restaurants, schools and markets somehow still open. Students and common hand laborers still do their work. Carpenters’ machinery is still loud and annoying. The sound of children playing fills the streets, irrespective of the garbage everywhere. On my way to my family’s hometown in Ibb Governorate, I heard about and followed the crazy, deadly airstrikes on the Médecins Sans Frontières (MSF) hospitals in Hajjah Province. It was not the first time MSF hospitals and clinics had been targeted. The images and reports of the civilians killed make me so angry and frustrated, then the awful photos of workers burned to death by the Saudi airstrike on the Al-Aqel food company in Sana’a (which killed 14 people). A single airstrike can destroy half a town. This is how the innocent die. Driving through the mountains, I thought more about the civilians and children killed. I have taken photos, but they are too shocking to publish. How will this end? It is amazing that the coalition forces, who are supposedly attempting to save Yemen from something, are destroying it instead – even the chicken farms. This has serious consequences; prices have increased dramatically. Last week, they targeted camel farms. The first day in my village it was quiet. We are in a rural, midland area. The next day, I began to visit all the areas that have been targeted nearby. The airstrikes are obliterating the homes of assumed leaders, but the houses in these ancient villages are so close to each other; one airstrike can destroy everything. Rural areas, humble water projects, farms, public buildings and schools have all been targeted, again and again and again. I am starting to question UNICEF statistics about how many schools and universities have been destroyed. Villagers in the midlands told me the warplanes even targeted public gatherings, weddings and football matches, as happened in the famous Makha case and the Sanabani wedding party in Thamar [the Makha strike is documented in a 59-page Human Rights Watch report, “Bombing Businesses: Saudi Coalition Airstrikes on Yemen’s Civilian Economic Structures,” which examines in detail 17 apparently unlawful airstrikes on 13 civilian economic sites, including factories, commercial warehouses, a farm, and two power facilities]. Ibb Governorate is the quietest, compared to other areas, which is why it has become a safe haven for hundreds of thousands of internally displace persons (IDPs). I was so happy and proud when I heard about how my town and village have been receiving and welcoming IDPs from all over Yemen – welcoming them, making them feel at home and integrating them into local life so quickly, based on real Yemeni values. I saw the same thing in Thamar Province. In both cases, they do not even call them IDPs. They think of them as common Yemeni citizens and brothers - guests first, then sharing common public duties and responsibilities like the rest. The only thing that gives me hope is that the towns and villages are full of energy and a desire to live. What the international and regional media report about sectarian divisions in Yemen makes me, and the people I meet, laugh. We never hear the terms Sunni and Shia. Yemenis act and behave as they have done for hundreds of years: Yemenis are friends, neighbors, cousins, and brothers across the assumed lines that many are trying to inflame. Regardless of small religious differences, we all still pray in the same mosques. Many wonder if the propaganda games will win out in the end. I hope not, because on the ground, relationships and bonds are holding for now. Another joy upon my return was to see the last remaining bridge in Wadi Bana still holding up. I thought it survived because of the prayers of poor farmers, as they depend on the bridge for so many things, especially in the flood seasons and during medical emergencies. But the day after I arrived, a pilot must have received an order to destroy it, and he did – this bridge, other bridges, and all the roads in the area. I can’t fathom what will be achieved by such massive destruction in a country already plagued by poor infrastructure. What do this coalition hope to achieve by targeting civilians? From afar, I questioned the true extent of the destruction I read about in the international press, human rights press releases and even UN reports, until I saw and lived it myself. The only thing that gives me hope for tomorrow is when I wake up in the morning and open my windows and see normal Yemenis still walking and driving around. The towns and villages are full of energy and a desire to live and carry on their daily lives regardless of the almost limitless obstacles compounding daily in this humanitarian catastrophe. These people are my real heroes in this portrait of war. I am proud to be home – to be in it, and to be one of them. A version of this piece was originally published by Peace Direct in Insight on Conflict, a resource for local peace building worldwide.